This 9 piece kitchen set has everything you need to get started, from measuring cups and mixing bowls, to a sieve and colander. With everything you need to mix, sift, drain, and measure, this is a comprehensive and space-saving kit for any kitchen. 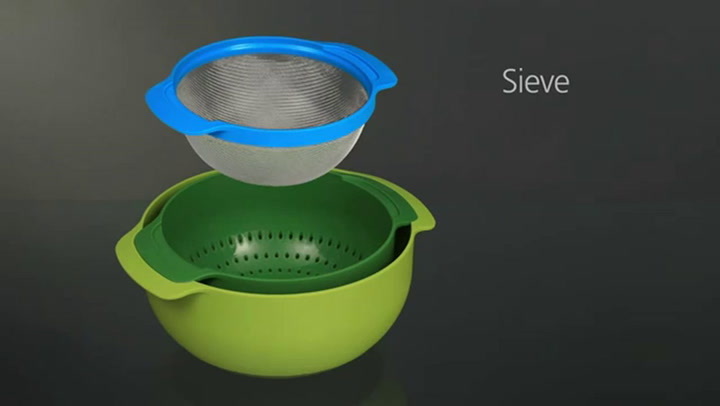 The mixing bowls, colander and sieve have wide handles, and the bowls have non-slip feet for easy mixing. The measuring cups snap together, and the whole set nests together to minimise the footprint when not in use, and the small bowl has measurements integrated into it. View more from Mixing Bowls, Cake Collection, For the baker and sweets maker, Gifts for The Baker, Joseph Joseph Prep Tools. This product is great to look at and of the highest quality. The items not only stack together, but actually clip into place on the handles, keeping everything securely in place. The bowls are rubberised underneath, ensuring they don't move while in use on our granite countertops. Perfect for our small, minimalist kitchen, where every utensil has to prove its worth! Cupboards getting to small? This product has several uses in one compact unit, taking up less storage space. An all in one beautiful and practical set - saves space and I love the non-slip idea. Excellent quality, practical and easily stored.